Cardiologists argue that people without other symptoms should ignore it altogether. 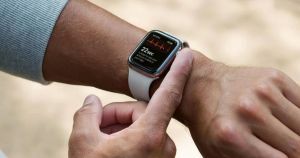 Last year, Apple revealed that its Apple Watch Series 4 would come with a built-in heart rate monitor, known as an EKG or ECG. According to Apple, the device would be able to flag abnormal heart rhythms like atrial fibrillation in people without other heart diseases — but now doctors have started to question whether or not the device will actually do anyone good. The watch does stand to help people who wouldn’t have otherwise learned about their heart problems. But the risk of false positives — healthy people whose heart rates still get flagged — could become a burden on the already-strained healthcare industry, The Verge reports. Ultimately, doctors who spoke to The Verge shared concerns that there isn’t enough evidence to justify this new technology against the risks of false positives that would cause Apple’s core healthy and wealthy demographic to take up the time and resources of doctors and hospitals that don’t have much to spare. “There’s no evidence there that the benefits outweigh the harms, so therefore, we recommend against using ECG screening for people at low risk for cardiovascular disease,” Dr. C. Seth Landefeld, chair of the department of medicine at the University of Alabama at Birmingham and member of the U.S. Preventative Services Task Force, told The Verge. For people who do have other heart conditions or symptoms, the Apple Watch’s EKG could serve as a good tool for detecting when something has gone wrong and a doctor’s visit is necessary. Without those other symptoms, Dr. Marcus suggests ignoring the wearable EKG altogether. These are early days for wearable EKGs, and the doctors’ recommendations could change as time goes on and we learn more — especially if the Apple Watch has a surge of popularity among the elderly or those with heart conditions. But for now, most Apple Watch users can probably ignore the alerts and trust that they’re just fine. More on fitness trackers: FITNESS TRACKERS SAY THIS COFFEE CUP HAS A PULSE. WAIT, WHAT?